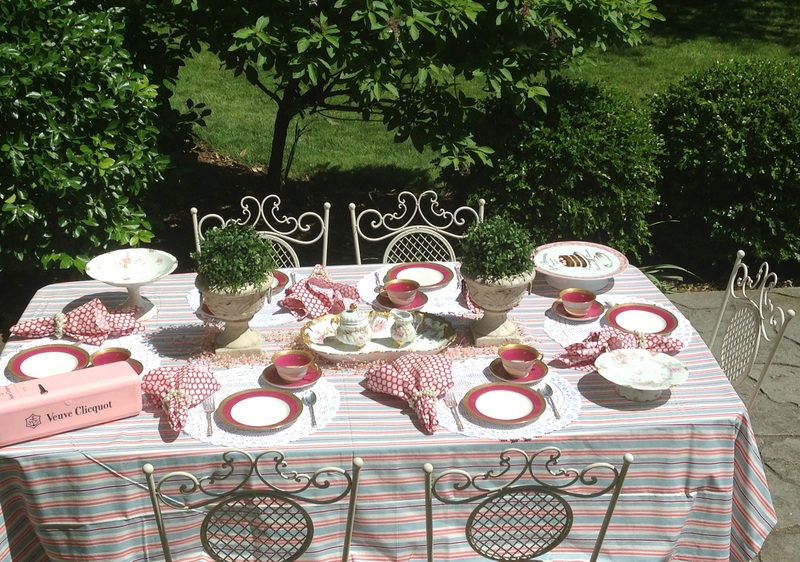 With the weather getting nicer sans cicadas, I was inspired to patioscape this weekend in some Spring hues! 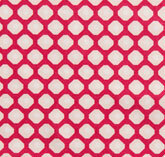 Once again, I turned to Hen House Linens for inspiration (I’m totally addicted to ther linens). 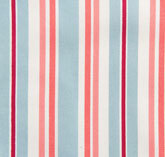 I selected their beautiful candy stripe pattern called “prepster stripe ocean” and coordinating “Spot On Raspberry” sure to add sweetness and light to any setting. 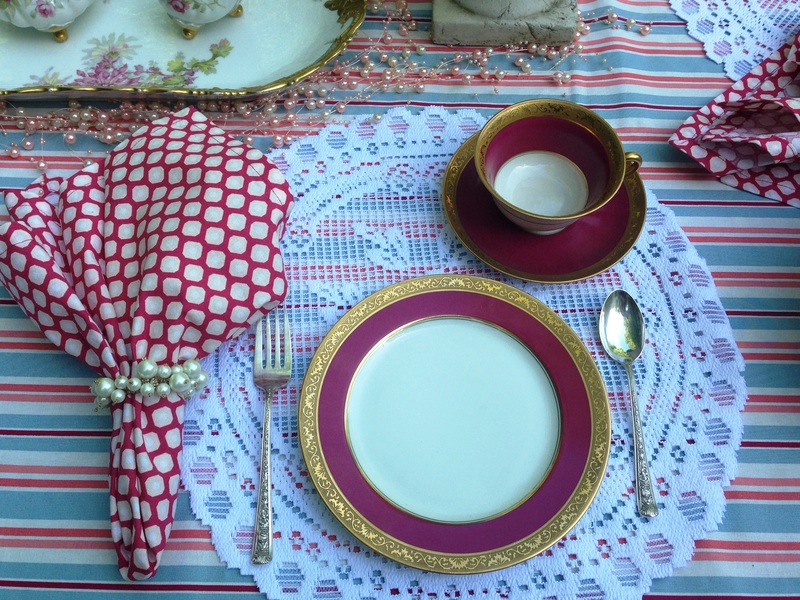 For the place setting I picked up the raspberry in the linens with this beautiful set of ruby red Raynaud Limoges dessert plates, cups, and saucers. This Raynaud pattern is called “Conde” which has been described as “veritable incrustation double dorure polie a l’agate” [true inlay gilding, double polished agate, 24k encrusted gold inlay]. There are three stamps on this set: “Limoges France”, “Raynaud Limoges”, and “Magasins de L’Union/12 Avenue de L’Opera” which means these probably originally came from a union shop of Limoges porcelain in Paris’ shopping district. 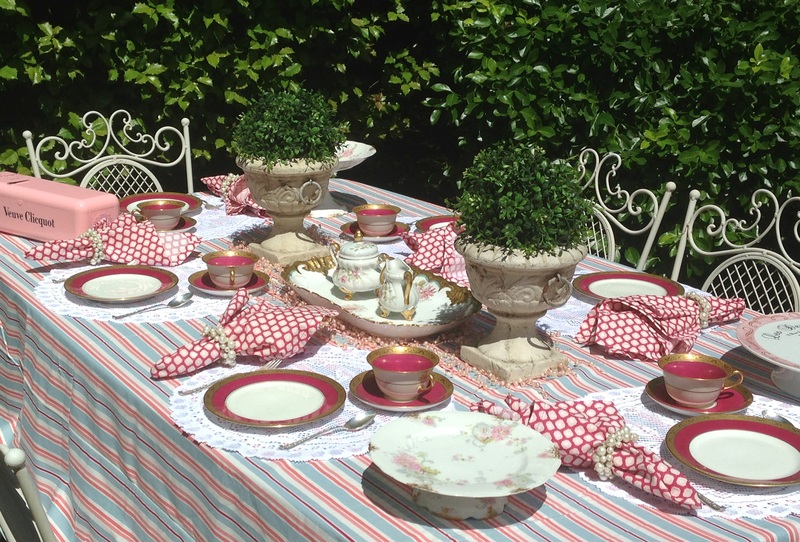 You can read more about this treasure I found while antiquing at Le Marché aux Puces St-Ouen de Clignancourt in Paris @ https://www.reddoortabledecor.com/2012/06/17/ruby-red-limoges-from-avenue-de-lopera/. I found this antique Limoges ice cream tray at Summit Antiques Center awhile back–I just love the beautiful gold scalloped edges. The Lewis Strauss & Sons red mark dates this piece from the 1891 to 1917. And with Spring in the air and Summer on the horizon, we felt it was time to set up this darling bird house. Veuve Clicquot in a pink box?!?!??!?!?!! I LOVE IT!!!!!! My elbow completely slipped off the desk when I saw that! WOW!!! I LOVE the raspberry/gold-rimmed dishes. Oh, my gosh…so pretty! It works so perfectly with the gorgeous linens you selected. 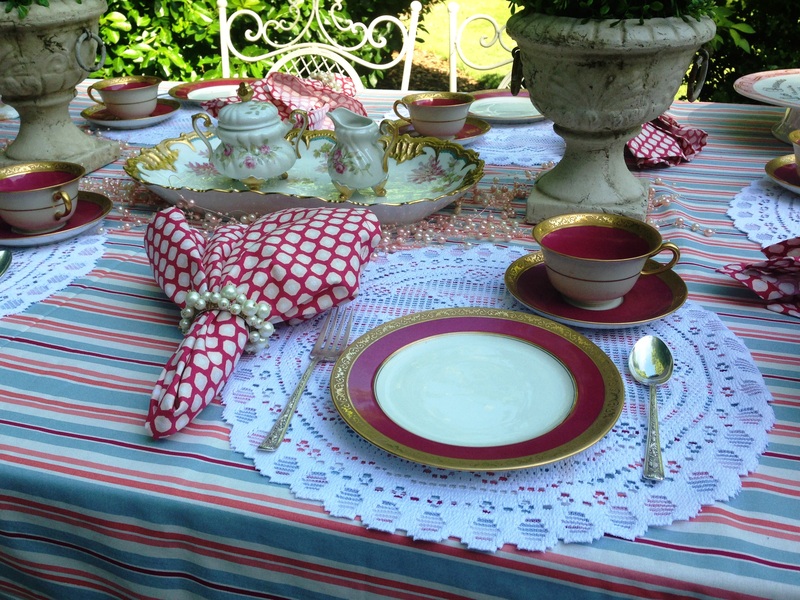 I love the striped tablecloth! It looks so happy, but not jumpin’-on-the-furniture-like-Tom-Cruise-out-of-control happy. 😉 The napkins are the perfect complement. With the pretty scrolled iron chairs and the organic centerpiece, this is absolutely regal!!! LOVE IT!! !